Use your evil eyes to count the zombies in the image below and post the total number on our Facebook wall. 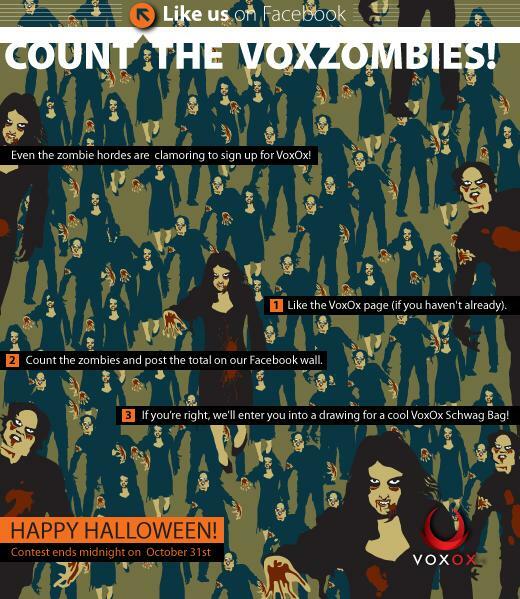 If you get the number right, you'll be entered into a drawing to win spooktacular Voxox Schwag! Score additional entries into the drawing by correctly answering zombie trivia on our Facebook page. Trivia will be posted daily, so check back often to better your chances of winning! Many will enter, but only one will make it out alive (or at least out with some cool Voxox schwag)... ENTER NOW! You knew there would be fine print. Here are the "official rules".